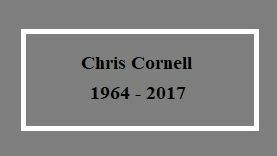 Chris Cornell, born as Christopher John Boyle (July 20, 1964 – May 18, 2017), was an American musician, singer and songwriter. He was best known as the vocalist and the guitarist for the Seattle band Soundgarden. Chris was born and grew up in Seattle, Washington. His parents, Edward F. Boyle, a pharmacist, and Karen Cornell, an accountant, divorced when he was a teenager and he adopted his mother’s maiden name as his own. As a child he was taking piano and guitar lessons. When he was in the elementary school, he first performed a song, One Tin Soldier, and his earliest musical influences were Little Richard and The Beatles. He felt lonely and depressed as a teenager, he dropped out of school and started experimenting with drugs at an early age but then turned towards music to channel his frustration in a more constructive way. He met a bassist Hiro Yamamoto and a guitarist Kim Thayil in the cover band The Shemps. They formed Soundgarden in 1984 and were later joined by a drummer Matt Cameron. Soundgarden signed to Sub Pop, releasing the Screaming Life EP in 1987 and the Fopp EP in 1988. Soon after, the band signed to an independent label SST Records and released their debut album, Ultramega OK, for which they earned a Grammy Award nomination for Best Metal Performance in 1990. This success enabled them a record contract with a major label A&M Records, making them the first grunge band to do so. Their subsequent albums Louder Than Love (1989), Badmotorfinger (1991) and Superunknown (1994) made the band one of the most successful acts of the rock and metal scene and brought it an international fame. However, with the release of the band’s fifth album, Down on the Upside (1996), the tension between the members of the band was growing, resulting in disbanding Soundgarden in 1997. In 1991 Chris co-wrote and recorded an album with Matt Cameron, Mike McCready and the remaining members of Mother Love Bone Jeff Ament and Stone Gossard to commemorate the late MLB singer Andrew Wood who was his friend and a roommate. The album and the band were called Temple of the Dog, a name taken from MLB’s song Man of Golden Words. A video was made to the song ‘Hunger Strike’ which featured Eddie Vedder, a singer of Pearl Jam. At the time of its release the album was not promoted, only a couple of shows took place in the Seattle area, however the project became a legend itself and the band reunited for a concert in 2015 and the US tour in 2016. After Soundgarden’s split, Chris concentrated on his solo career. His first solo album Euphoria Morning, was released in 1999 and promoted with a long tour. The album’s single ‘Can’t Change Me’ was nominated for Best Male Rock Vocal Performance at the 2000 Grammy Awards. In 2011 Audioslave was formed by the ex-members of Rage Against The Machine who contacted Chris Cornell after the suggestion of Rick Rubin. The band released their self-titled debut album in 2002 and has reached triple platinum status in the United States. Audioslave’s second album, Out of Exile, was released in May 2005 and debuted at number one on the US charts. On May 6, 2005, the band played a free show for an audience of 70,000 people in Havana, Cuba, becoming the first American rock group to perform a concert in Cuba. The 26-song set concert was the longest the band had ever played. In 2006 their third album, Revelations, was released but contrary to previous albums it was not accompanied by an extensive tour. Chris Cornell took some time off to work on the solo material including the song ‘You Know My Name’, the theme song for the 2006 James Bond film, Casino Royale. He released his second solo album, Carry On, in 2007, soon after his departure from Audioslave. The album was promoted on tour as a support to Aerosmith and Linkin Park, with his active participation in the shows of the latter. He worked with the producer Timbaland on his studio album Scream, which was released on March 10, 2009. The album was not widely acclaimed by the critics but turned out to be a financial success. In November 2011 he released Songbook, an acoustic live album featuring songs recorded during his ‘Songbook’ tour in North America. His last studio album, Higher Truth, was released on September 18, 2015. On January 20, 2017 Audioslave reunited briefly for Prophets of Rage’s Anti-Inaugural Ball, protesting President Donald Trump’s inauguration as President of the United States. Apart from that, Chris Cornell has collaborated with many artists and contributed to many musical projects. Together with Layne Staley and Jerry Cantrell of Alice in Chains, and Mark Arm of Mudhoney, he contributed vocals on the Alice in Chains song ‘Right Turn’, from the 1992 EP Sap, although the band given credit for this song is Alice Mudgarden. Also in 1992 he performed a song ‘Hey Baby (New Rising Sun)’ with Mike McCready, Jeff Ament and Matt Cameron on the tribute album to Jimi Hendrix (as M.A.C.C.). His other noteworthy collaborations include Screaming Trees, Alice Cooper, Eleven, Ann and Nancy Wilson, David Cook, Slash, Gabin, Carlos Santana among others. His songs are included in numerous soundtracks and he also acted in a cameo role and an onstage performance in Cameron Crowe’s 1992 Seattle-based film, Singles. He was found dead in his Detroit hotel room early on the morning of May 18, 2017, after performing at a Soundgarden concert an hour earlier. His death was ruled suicide by hanging. His body was cremated and his funeral took place on May 26, 2017, at the Hollywood Forever Cemetery in Los Angeles.